Great relaxation after an adventuresome day.This recliner offers the features of our larger models d.. 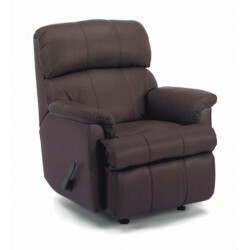 Enjoy the support and comfort of this recliner in your motor home or RV for years to come. Curved ar.. Enjoy the support and comfort of this recliner in your motor home or towable for years to come. Low,.. While offering superior comfort our recliners take up very little space. These wood and steel frame .. While offering superior comfort our recliners take up very little space. These wood and steel fr..
Secures to floor with 1/2" bolts, can accommodate a seat belt and has slide tracks that allow chair..